Franz Boas (July 9, 1858 – December 22, 1942) was one of the pioneers of modern anthropology and is often called the "Father of American Anthropology." Like many such pioneers, he trained in other disciplines, receiving his doctorate in physics and pursuing post-doctoral studies in geography. German by birth, Boas worked for most of his life in the United States. His most significant achievement within anthropology was to change the prevailing view from cultural evolution to one of "cultural relativism." Boas' research revealed that cultural differences were not biological in origin, and he believed that it was his responsibility as a scientist to use the evidence of his research to expose the misconception of white superiority and fight racism. His efforts thus contributed to the view of one human family. 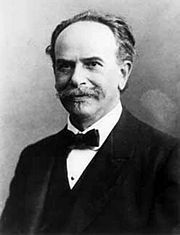 Franz Boas was born in Minden, Westphalia, Germany. Although his grandparents were observant Jews, his parents, like most German Jews, embraced Enlightenment values, including their assimilation into modern German society. Boas was sensitive about his Jewish background, and while he vocally opposed anti-Semitism, and refused to convert to Christianity, he did not identify himself as a Jew. From his early experience at the Froebel kindergarten in Minden, to his studies at the gymnasium, Boas was exposed to natural history. Of his work at the gymnasium, he was most excited by and proud of his research on the geographic distribution of plants. Nevertheless, when Boas attended university, first at Heidelberg, then Bonn, he focused on mathematics and physics. He intended to study physics at Berlin, but chose to attend the university at Kiel, in order to be closer to his family. There he studied physics with Gustav Karsten. Boas wished to conduct research concerning Gauss's law of the normal distribution of errors, but Karsten instructed him to research the optical properties of water instead. That research became the basis of his doctoral dissertation. Boas received his doctorate in physics from the university at Kiel in 1881. He was unhappy with his dissertation, but intrigued by the problems of perception that plagued his research. He had developed an interest in Kantian thought, and took a course on aesthetics with Kuno Fischer at Heidelberg, and with Benno Erdmann at Bonn, two leading Kantian philosophers. This interest led him to psychophysics, which addressed psychological and epistemological problems in physics. He considered moving to Berlin to study psychophysics with Hermann von Helmholtz, but psychophysics was of dubious status and Boas had no training in psychology. Coincidentally, geographer Theobald Fischer had moved to Kiel, and Boas took up geography as a way to explore his budding interest in the relationship between subjective experience and the objective world. At the time, German geographers were divided over the causes of cultural variation. Many argued that the physical environment was the principal determining factor, but others (notably Friedrich Ratzel) argued that the diffusion of ideas through human migration was more important. In 1883, Boas went to Baffin Island to conduct geographic research on the impact of the physical environment on native (Inuit) migrations. He returned to Berlin to finish his studies, and in 1886 (with Helmholtz' support), he successfully defended his habilitation thesis, "Baffin Land," and was named privatdozent in geography. While on Baffin Island, Boas began to develop an interest in studying non-Western cultures, and in 1888, he published The Central Eskimo, based on this work. In 1885, he went to work with physical anthropologist Rudolf Virchow and ethnologist Adolf Bastian at the Royal Ethnological Museum in Berlin. Boas had studied anatomy with Virchow two years earlier, while preparing for the Baffin Island expedition. At the time, Virchow was involved in a vociferous debate with his former student, Ernst Haeckel, over evolution. Haeckel had abandoned his medical practice to study comparative anatomy after reading Charles Darwin's The Origin of Species, and vigorously promoted Darwin's ideas in Germany. Virchow favored Lamarckian models of evolution, based on the idea that environmental forces could precipitate rapid and enduring changes in organisms that had no inherited source. Thus, Lamarckians and environmental determinists often found themselves on the same side of the debate. Boas, however, worked more closely with Bastian, who was noted for his antipathy to environmental determinism. Instead, Bastian argued for the "psychic unity of mankind," a belief that all human beings had the same intellectual capacity, and that all cultures were based on the same basic mental principles. Variations in custom and belief, he argued, were the products of historical accidents. This view resonated with Boas’ experiences on Baffin Island, and drew him towards anthropology. While at the Royal Ethnological Museum, Boas became interested in the Native Americans of the Pacific Northwest, and after defending his habilitation thesis, he left for a three-month trip to study the Kwakiutl and other tribes of British Columbia. On his way back he visited New York. In January 1887, he was offered a job in New York as assistant editor of the journal Science. Alienated by growing anti-Semitism and nationalism, as well as the very limited academic opportunities for a geographer in Germany, Boas decided to stay in the United States. His first teaching position was at Clark University in Massachusetts. Boas' opportunities at Clark were limited, however, because the university did not have an anthropology department. Moreover, Boas was concerned about university president G. Stanley Hall's interference in his research. In 1892, Boas joined a number of other Clark faculty in resigning, to protest Hall's infringement on academic freedom. Boas was then appointed chief assistant in anthropology at the Columbian Exposition in Chicago. In the late 1800s, anthropology in the United States was dominated by the Bureau of American Ethnology (BAE), directed by John Wesley Powell, a geologist who favored Lewis Henry Morgan's theory of cultural evolution. The BAE was housed at the Smithsonian Institution in Washington, DC. The Peabody Museum at Harvard University was an important, though lesser, center of anthropological research. It was while working on museum collections and exhibitions that Boas formulated his basic approach to culture. This led him to break with museum work and seek to establish anthropology as an academic discipline. During this period, Boas made five more trips to the Pacific Northwest. His continuing field research led him to think of culture as a local context for human action. This emphasis on local context and history led him to oppose the dominant model at the time—cultural evolution. Boas initially broke with evolutionary theory over the issue of kinship. Lewis Henry Morgan had argued that all human societies move from an initial form of matrilineal organization to patrilineal organization. Indian groups on the northern coast of British Columbia, like the Tsimshian and Tlingit, were organized into matrilineal clans. Indians on the southern coast, like the Nootka and the Salish, however, were organized into patrilineal groups. Boas focused on the Kwakiutl, who lived between the two clusters. The Kwakiutl seemed to have a mix of features. Prior to marriage, a man would assume his wife's father's name and crest. His children took on these names and crests as well, although his sons would lose them when they got married. Names and crests thus stayed in the mother's line. Boas argued that the Kwakiutl were changing from a prior patrilineal organization to a matrilineal one, as they learned about matrilineal principles from their northern neighbors. Boas’ rejection of Morgan's theories led him, in an 1887 article, to challenge Mason's principles of museum display. At stake, however, were more basic issues of causality and classification. The evolutionary approach to material culture led museum curators to organize objects on display according to function or level of technological development. Curators assumed that changes in the forms of artifacts reflected some natural process of progressive evolution. Boas, however, felt that the form an artifact took reflected the circumstances under which it was produced and used. He claimed that even artifacts that were similar in form might have developed in very different contexts, for different reasons. Boas had a chance to apply his approach to exhibits when he was hired to assist Frederick Ward Putnam, director and curator of the Peabody Museum at Harvard University, who had been appointed as head of the department of ethnology and archeology for the Chicago Fair in 1892. Boas arranged for 14 Kwakiutl Indians from British Columbia to come and reside in a mock Kwakiutl village, where they could perform their daily tasks in context. After the exposition, Boas worked at the newly-created Field Museum in Chicago until 1894, when he was replaced (against his will) by BAE archeologist William Henry Holmes. In 1896, Boas was appointed assistant curator of ethnology and somatology of the American Museum of Natural History. In 1897, he organized the Jesup Expedition, a five-year long field-study of the natives of the Pacific Northwest, whose ancestors were believed to have migrated across the Bering Strait from Siberia. He attempted to organize exhibits along contextual, rather than evolutionary, lines. His approach brought him into conflict with the president of the museum, Morris Jesup, and its director, Hermon Bumpus. He resigned in 1905, never to work for a museum again. Boas had been appointed lecturer in physical anthropology at Columbia University in 1896, and had been promoted to professor of anthropology in 1899. However, the various anthropologists teaching at Columbia had been assigned to different departments. When Boas left the Museum of Natural History, he negotiated with Columbia University to consolidate the various professors into one department, of which Boas would take charge. Boas' program at Columbia thus became the first Ph.D. program in anthropology in America. During this time, Boas played a key role in organizing the American Anthropological Association (AAA) as an umbrella organization for the emerging field. Boas originally wanted the AAA to be limited to professional anthropologists, but W.J. McGee (another geologist who had joined the BAE under Powell's leadership) argued that the organization should have open membership. McGee's position prevailed and he was elected the organization's first president in 1902; Boas was elected as one of the vice-presidents, along with Putnam, Powell, and Holmes. At both Columbia and the AAA, Boas encouraged the "four field" concept of anthropology—physical anthropology, linguistics, archaeology, and cultural anthropology. His work in these fields was pioneering: in physical anthropology, he led scholars away from static taxonomical classifications of race to an emphasis on human biology and evolution; in linguistics, he broke through the limitations of classic philology and established some of the central issues in modern linguistics and cognitive anthropology; in cultural anthropology, he (along with Bronislaw Malinowski) established the contextualist approach to culture, cultural relativism, and the participant-observation method of fieldwork. The four-field approach was understood not merely as bringing together different kinds of anthropologists into one department, but as re-conceiving anthropology through the integration of different objects of anthropological research into one overarching object. This was one of Boas' fundamental contributions to the discipline, and came to differentiate American anthropology from English, French, or German approaches. These questions signaled a marked break from then-current ideas about human diversity, which assumed that some people have a history, evident in a historical (or written) record, while other people, lacking writing, also lack history. For some, this distinction between two different kinds of societies explained the difference between history, sociology, economics, and other disciplines that focus on people with writing, and anthropology, which was supposed to focus on people without writing. Boas rejected this distinction between kinds of societies, and the subsequent division of labor in the academy. He understood all societies to have a history, and all societies to be proper objects of anthropological study. In order to approach literate and non-literate societies the same way, he emphasized the importance of studying human history through the analysis of things other than written texts, pointing to biology, linguistics, and ethnology. In one of Boas' most important books, The Mind of Primitive Man (1911), he integrated these various concerns and established a program that would dominate American anthropology for the next fifteen years. In this study he claimed that in any given population, biology, language, material, and symbolic culture are autonomous; that each is an equally important dimension of human nature, but that no one of these dimensions is reducible to another. In other words, culture does not depend on any independent variables. He emphasized that the biological, linguistic, and cultural traits of any group of people are the product of historical developments involving both cultural and non-cultural forces. Thus, he claimed that cultural plurality is a fundamental feature of humankind. Boas' work in physical anthropology brought together his interest in Darwinian evolution with his interest in migration as a cause of change. His most important research in this field was his study of changes in body form among children of immigrants in New York. Other researchers had already noted differences in height, cranial measurements, and other physical features between Americans and people from different parts of Europe. Many used these differences to argue that there is an innate biological difference between races. Boas' primary interest was the study of processes of cultural change. He therefore set out to determine whether bodily forms are also subject to processes of change. Boas found that an average measure of cranial size of immigrants was significantly different from members of these groups who were born in the United States. Moreover, he discovered that average measures of cranial size of children born within ten years of their mothers' arrival were significantly different from those of children born more than ten years after their mothers' arrival. Boas did not deny that physical features such as height or cranial size were inherited; he did, however, argue that the environment has an influence on these features, which is expressed through change over time. His findings were radical at the time and continue to be debated. This work was central to his influential argument that differences between races were not immutable. Although some sociobiologists and evolutionary psychologists have suggested that Boas was opposed to Darwinian evolution, Boas was actually a committed proponent of Darwinian evolutionary thought. In fact, Boas' research on changes in body form played an important role in the rise of Darwinian theory. To understand this, it is crucial to remember that Boas was trained at a time when biologists had no understanding of genetics: Mendelian genetics became widely known only after 1900. Although Boas published descriptive studies of Native American languages, and wrote on theoretical difficulties in classifying languages, he left it to his colleagues and students to research the relationship between language and culture. His 1889 article On Alternating Sounds, made a singular contribution to the methodology of both linguistics and cultural anthropology. He wrote this as a response to a paper presented in 1888 by Daniel Garrison Brinton, at the time a professor of American linguistics and archaeology at the University of Pennsylvania. Brinton observed that in the spoken languages of many Native Americans certain sounds were regularly alternated. He added that there were many words that, even when repeated by the same speaker, varied considerably in their vocalization. Using evolutionary theory, Brinton argued that this pervasive inconsistency was a sign of linguistic inferiority, and evidence that Native Americans were at a low stage in their evolution. Boas objected to his conclusion. Instead, he shifted attention to the perception of different sounds. When people describe one sound in different ways, is it because they cannot perceive the difference, or might there be another reason? He immediately established that he was not concerned with cases involving perceptual deficit—the aural equivalent of color-blindness. He pointed out that the question of people who describe one sound in different ways is comparable to that of people who describe different sounds in one way. This was crucial for research in descriptive linguistics: when studying a new language, how are the pronunciation of different words to be noted? People may pronounce a word in a variety of ways and still recognize that they are using the same word. The issue, then, is not that such sensations are not recognized in their individuality, but that sounds are classified according to their similarity. In other words, people classify a variety of perceived sounds into one category. The English word "green" can be used to refer to a variety of shades, hues, and tints. But there are some languages that have no word for "green." In such cases, people might classify what one would call "green" as either "yellow" or "blue." People categorize similar colors in a different way than English speakers. In the same way, Boas argued that the Inuit people categorized the sounds differently from the English-speaking researchers. Although Boas was making a very specific contribution to the methods of descriptive linguistics, his ultimate point was far reaching—observer bias need not be personal, it can be cultural. In other words, the perceptual categories of Western researchers may systematically cause a Westerner to misperceive, or to fail to perceive entirely, a meaningful element in another culture. This point provided the methodological foundation for Boas' cultural relativism: elements of a culture are meaningful in that culture's terms, even if they may be meaningless in another culture. cultural relativism as a methodological tool while conducting fieldwork, and as an heuristic tool while analyzing data. Although other anthropologists at the time, such as Bronislaw Malinowski and Alfred Radcliffe-Brown focused on the study of societies, which they understood to be clearly bounded, Boas' attention to history, which reveals the extent to which traits diffuse from one place to another, led him to view cultural boundaries as multiple, overlapping, and highly permeable. Boas understood that as people try to make sense of their world they seek to integrate its disparate elements, with the result that different cultures could be characterized as having different configurations or patterns. But Boasians also understood that such integration was always in tension with diffusion, and any appearance of a stable configuration is usually temporary (see Bashkow 2004: 445). Boas thought of culture as fundamentally dynamic: "As soon as these methods are applied, primitive society loses the appearance of absolute stability…. All cultural forms rather appear in a constant state of flux…" (Lewis 2001b). Having argued against the distinction between literate and non-literate societies as a way of defining anthropology's object of study, Boas argued that both types of society should be analyzed in the same way. Nineteenth-century historians had been applying the techniques of philology to reconstruct the histories of, and relationships between, literate societies. In order to apply these methods to non-literate societies, Boas argued that the task of fieldworkers was to produce and collect texts in non-literate societies. This took the form not only of compiling lexicons and grammars of the local language, but of recording myths, folktales, beliefs about social relationships and institutions, and even recipes for local cuisine (see Bunzl 2004: 438–439). One of the greatest accomplishments of Boas and his students was their critique of theories of physical, social, and cultural evolution current at that time. This critique was central to Boas' museum work, as well as his work in all four fields of anthropology. Theories of cultural evolution argued that all societies progress through the same stages in the same sequence. Thus, although the Inuit, with whom Boas worked on Baffin Island, and the Germans, with whom he studied as a graduate student, were contemporaries of one another, evolutionists argued that the Inuit were at an earlier stage in their evolution, and Germans at a later stage. This echoed a popular misreading of Darwin that suggested that human beings are descended from chimpanzees. In fact, Darwin argued that chimpanzees and humans were equally evolved. What characterized Darwinian theory was its attention to the "processes" by which one species transforms into another: "adaptation" as a key principle in explaining the relationship between a species and its environment; and "natural selection" as a mechanism of change. Boas, although supporting Darwinian theory, did not assume that it automatically applied to cultural and historical phenomena. The notion of evolution that the Boasians ridiculed and rejected the most was the then-dominant belief in orthogenesis—a determinate or teleological process of evolution in which change occurs progressively regardless of natural selection. Boas rejected the prevalent theories of social evolution developed by Edward Burnett Tylor, Lewis Henry Morgan, and Herbert Spencer, not because he rejected the notion of "evolution" per se, but because he rejected orthogenetic notions of evolution in favor of Darwinian evolution. Boasian research revealed that virtually every claim made by cultural evolutionists was contradicted by the data, or reflected a profound misinterpretation of the data. Boas suggested instead that cultures develop and evolve not in same sets of stages, but in unique ones, depending on each culture's particular historical and environmental circumstances. Thus, Boas suggested that what appeared to be patterns or structures in a culture were not a product of conscious design, but rather the outcome of diverse mechanisms that produce cultural variation (such as diffusion and independent invention), shaped by the social environment in which people live and act (Lewis 2001b). Finally, Boas' approach of "cultural relativism" superseded cultural evolution, becoming dominant in anthropology through the work of his students. Boas believed that anthropologists had an obligation to speak out on social issues. He was especially concerned with racial inequality, which he had demonstrated was not biological in origin, but rather social. An early example of this concern is evident in his 1906 commencement address to Atlanta University. Boas objected to the claim that European and Asian civilizations were more advanced than African societies. Although the technological advances of our early ancestors (such as taming fire and inventing stone tools) might seem insignificant when compared to the invention of the steam engine or control over electricity, he argued that we should consider that they might actually be even greater accomplishments. Boas catalogued advances, such as smelting iron, cultivating millet, and domesticating chickens and cattle, that occurred in Africa well before they spread to Europe and Asia. He described the activities of African kings, diplomats, merchants, and artists as evidence of cultural achievement. From this, he concluded, any social inferiority of Negroes in the United States cannot be explained by their African origins. Boas believed that as a scientist it was his responsibility to argue against white myths of racial purity and racial superiority, and to use the evidence of his research to fight racism. A person, who uses science as a cover for political spying, who demeans himself to pose before a foreign government as an investigator and asks for assistance in his alleged researches in order to carry on, under this cloak, his political machinations, prostitutes science in an unpardonable way and forfeits the right to be classed as a scientist. Boas continued to speak out against racism and for intellectual freedom. When the Nazi Party in Germany denounced "Jewish Science" (which included not only Boasian anthropology but Freudian psychoanalysis and Einsteinian physics), Boas responded with a public statement signed by over 8,000 other scientists, declaring that there is only one science, to which race and religion are irrelevant. Between 1901 and 1911, Columbia University produced seven Ph.D.s in anthropology. Although by today's standards this is a very small number, at that time it was sufficient to establish Boas' anthropology department at Columbia as the preeminent program in the country. Moreover, many of Boas' students went on to establish anthropology programs at other major universities. Boas' first doctoral student was Alfred L. Kroeber (1901), who, along with fellow Boas student Robert Lowie (1908), started the anthropology program at the University of California at Berkeley. He also trained William Jones (1904), one of the first Native American Indian anthropologists. Boas also trained a number of other students who were influential in the development of academic anthropology: Frank Speck (1908), who trained with Boas but received his Ph.D. from the University of Pennsylvania and immediately proceeded to found the anthropology department there; Edward Sapir (1909) and Fay-Cooper Cole (1914), who developed the anthropology program at the University of Chicago; Leslie Spier (1920), who started the anthropology program at the University of Washington; and Melville Herskovits (1923), who started the anthropology program at Northwestern University. He also trained John Reed Swanton, Paul Radin (1911), Ruth Benedict (1923), Gladys Reichard (1925), Alexander Lesser (1929), and Margaret Mead (1929), and was an influence on Claude Lévi-Strauss, whom he met during the latter's stay in New York in the 1940s. Several of Boas' students went on to serve as editors of the American Anthropological Association's flagship journal, American Anthropologist: John R. Swanton (1911, 1921–1923), Robert Lowie (1924–1933), Leslie Spier (1934–1938), and Melville Herskovits (1950–1952). Edward Sapir's student John Alden Mason was editor from 1945 to 1949, and Alfred Kroeber and Robert Lowie's student, Walter Goldschmidt, was editor from 1956 to 1959. Most of Boas' students shared his concern for careful, historical reconstruction, and his antipathy towards speculative, evolutionary models. Moreover, Boas encouraged his students, by example, to criticize themselves as much as others. Several of his students soon attempted to develop theories of the grand sort that Boas typically rejected. Kroeber called his colleagues' attention to Sigmund Freud and the potential of a union between cultural anthropology and psychoanalysis. Ruth Benedict developed theories of "culture and personality" and "national cultures," and Kroeber's student, Julian Steward developed theories of "cultural ecology" and "multilineal evolution." Nevertheless, Boas has had an enduring influence on anthropology. The majority of postmodern anthropologists accepted Boas’ commitment to empiricism and his methodological cultural relativism. They shared Boas’ commitment to field research involving extended residence, learning the local language, and developing social relationships with informants. Boas' approach to culture in term of cultural relativism was a major contribution to modern anthropological science. Finally, anthropologists continue to honor his critique of racial ideologies. In his 1963 book, Race: The History of an Idea in America, Thomas Gossett wrote that "It is possible that Boas did more to combat race prejudice than any other person in history." Boas, Franz. (n.d.). The relation of Darwin to anthropology, notes for a lecture; Boas papers (B/B61.5), American Philosophical Society, Philadelphia. Published online with Herbert Lewis 2001b. Bashkow, Ira. 2004. "A Neo-Boasian Conception of Cultural Boundaries." American Anthropologist 106(3): 443–458. Bunzl, Matti. 2004. "Boas, Foucault, and the 'Native Anthropologist." American Anthropologist 106(3): 435–442. Gelya, Frank. 1997. "Jews, Multiculturalism, and Boasian Anthropology." American Anthropologist 99(4): 731–745. Glick, Leonard B. 1982. "Types Distinct from Our Own: Franz Boas on Jewish Identity and Assimilation." American Anthropologist 84(3): 545–565. Hart, Mitchell. 2003. "Franz Boas as German, American, Jew," in Christof Mauch and Joseph Salmons (eds.) German-Jewish Identities in America. Madison: Max Kade Institute, pp. 88–105. Kroeber, Alfred. 1949. "An Authoritarian Panacea." American Anthropologist 51(2): 318–320. Lewis, Herbert. 2001a. "The Passion of Franz Boas." American Anthropologist 103(2): 447–467. Lewis, Herbert. 2001b. "Boas, Darwin, Science and Anthropology." Current Anthropology 42(3): 381–406. A reassessment of human cranial plasticity: Boas revisited – Summary of critical paper by Corey S. Sparks and Richard L. Jantz. This page was last modified on 8 May 2017, at 22:25.